Only three droughts in the Dust Bowl years of the 1930s (1934, 1939 and 1931) and two droughts in the 1950s (1954 and 1956) were more devastating than the drought of 2012. 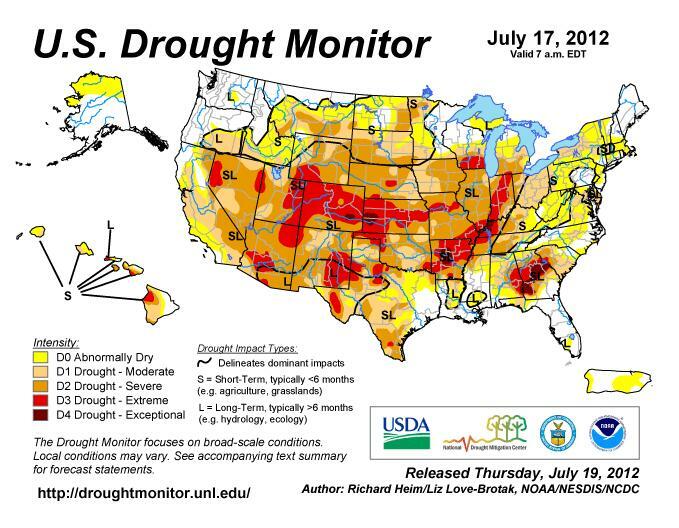 What we have seen in the past 2 years in the Midwest—is not a slow creeping drought—what we are seeing are FLASH DROUGHTS—these are particularly vicious and dangerous droughts. Last year at this time, around 60% of the U.S. corn crop was rated good or excellent. This year, only 26% earns those rankings. More than 1,300 counties in 26 states are being named natural-disaster areas, the biggest such declaration ever by the U.S. Department of Agriculture. Iowa saw temperatures as hit 106 on Monday. That’s five degrees above the previous record and fully 20 degrees above average. Iowa is the top U.S. corn and soybean producer. America is the world’s largest exporter of corn, wheat and soy beans; global prices for those commodities are at record levels. The extended drought means we will see higher food prices at the supermarket. In Leviticus 26, God promises “rain in due season” and that “the land shall yield her increase” (verse 4)—“if ye walk in my statutes, and keep my commandments, and do them” (verse 3). But when we as a people ignore God’s commandments, our leaders embrace gay marriage, and we continue to abort our children—can we expect God’s blessings? God will often use weather as a form of punishment (Amos 4:7). “I also withheld rain from you when the harvest was still three months away. I sent rain on one town, but withheld it from another. One field had rain; another had none and dried up”. There is no question that the time of National Punishment is before us.